Planning to launch a great site to sell premium kinds of wine online? Can't put your dreams into reality, since you have no time and no special programming skills? You have found a great product to meet your demands! Don't spend big money and seek out specialists to develop a website for you. 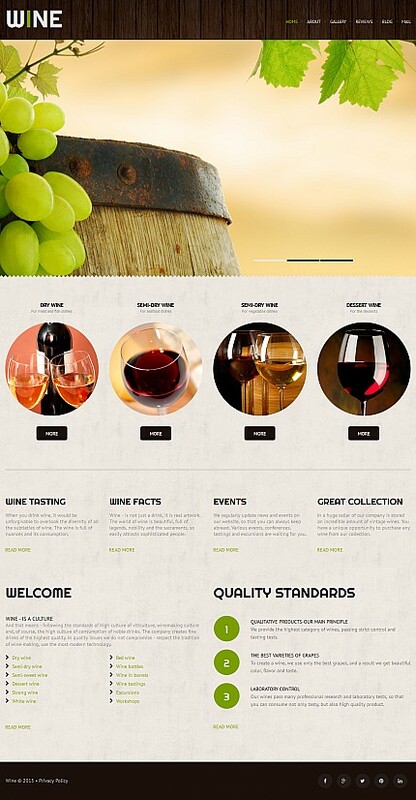 Try our adaptive Winery Responsive Moto CMS 3 Template matching your business requirements exactly. Need more reasons why we warrant that our theme powered by Moto CMS 3.0 is what you need? There's nothing to it! Using a simple winery website builder, you will modify your site like a shot regardless of what you would like to change - either make the colors suit your business style or insert an additional page. We are here to make website development less complicated for you! Purchase our Winery Responsive Moto CMS 3 Theme and establish a website in a couple of clicks - install, add your information and relax.